YOU MAY EXPERIENCE LONG WAIT TIMES IN THE OFFICE. WE CAN HANDLE MOST OF YOUR NEEDS ONLINE OR BY PHONE. DIRECTIONS: FROM THE NORTH TAKE STATE HWY 360 SOUTH TO BROWN ST. EXIT ATBROWN, TURN LEFT CROSSING OVER ST HWY 360 AND LEFT AGAIN ONTO THE NORTHBOUND SERVICE ROAD. REMAIN ON THE SERVICE ROAD FOR ABOUT A QUARTER MILE. THE OFFICE IS ON THE RIGHT NEXT DOOR TO THE HAMPTON INN AND IHOP. The Grand Prairie Social Security office is located in Grand Prairie 75050. The following page includes information for this location like the office phone number, hours of operation and driving directions. If you have any interests or comments about your retirement benefits or are interested in making an appointment, call the following Grand Prairie Social Security office. The Grand Prairie Social Security office is located in Grand Prairie 75050. The following page features information for this location like the office phone number, hours of operation and driving directions. 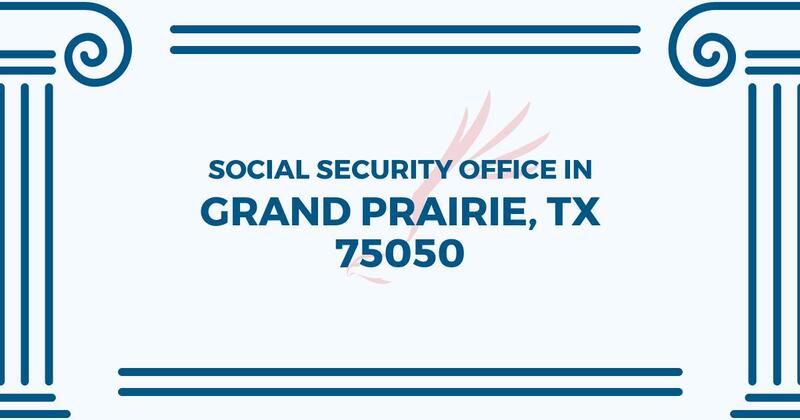 If you have any curiosities or comments about your Social Security benefits or are interested in planning an appointment, call the following Grand Prairie Social Security office. I called SS office today and was very pleased to be taken care of immediately! I was also informed in a very nice voice that I will need to go the a SS office near me to present my Birth Certificate due to all of the changes taking place and all of the baby boomers applying/signing up! I hung up with a smile on my face, even though I have to take an extra step and actually go into the SS office to get started! Thank you! I have tried to reinstate my disability benefits. So far it’s been 2 weeks and 2 days and I have not heared from the examiner’s office after being told by Ms. Patel that if I had not heared from the examiner’s office to contact her. There is no number to call her so I went to the soc sec office in Grand Prairie and waited 2 hrs only to find out she was out. The other assistant said there was nothing uploaded in the system regarding my reinstatement but took my number for Ms Patel to return my call. No reply so far…just sit and wait….so I called the examiner’s office with the number Ms Patel gave me on my first visit and was told they did not see a request for reinstatement…another wait I suppose. I must add, the security guards are a hoot! I went there today to get a name changed on my SS card. I cannot say enough good things about the employees here. I was greeted by an officer and told exactly what to do. He smiled and was so friendly. He and the other officer kept the environment lively and most of us in the waiting room couldn’t help but smile. Don’t get me wrong, there were some grumpy people, but the majority were talking to each other and enjoying the officers jokes, music and conversation. If I ever have to do back to the SS Admin., this is the office I will drive too, even though there are several closer to my home. Our experience was great. We got in line about 8:35 am. There appeared to be about 40 folks ahead of us. The doors opened about 8:45. Two friendly and cheerful security officers greeted everyone and explained the process for taking a number, which depends on the purpose of your visit. This location has 35 customer service agents, and we were speaking to one by around 9:05. Her name was Ms. Sam, if I remember correctly. She was very friendly and helpful. We had two issues to discuss, and she took the time to make sure she gave us as much help as possible for both issues.